onCourse is pre-configured with a whole range of SEO features to make your life easier and get good search ranking with minimal effort. Although we take care of many of the technical details, there is absolutely no substitute for writing good copy. That is, if you don't spend the time to write words which will get you ranking, then you are doomed from the outset. But if you write course descriptions and tag descriptions which are both engaging to potential students and use the correct search terms that people will search for, you are well on your way to a successful website. When we build your site, we'll give you access to Google Tag Manager, set up some initial Analytics tags for you, and get you started. You can then build more tracking or hand over access to your SEO consultants. We will continue to need access to tag manager so that we can debug problems and update core code as needed. Transactional sales dollars. Every sale through the website puts the dollar value into your Analytics. So not only can you see how many page views you got from that ad campaign, you can see the dollar value of the sales that generated. You'll discover that the two aren't always correlated. Do you care about ten thousand views from Facebook likes or the 200 real sales from a targeted campaign? This is how you can tell the difference. Course and products. Drill down in your data to see where sales are coming from. Getting lots of language course sales from an ad you placed on a friendly site? Great, now you know what works and where to focus your time and money. Events. Because we log "add to shopping basket" and other events, you'll be able to see who is engaging with your site but not following through to the end. Checkout steps. 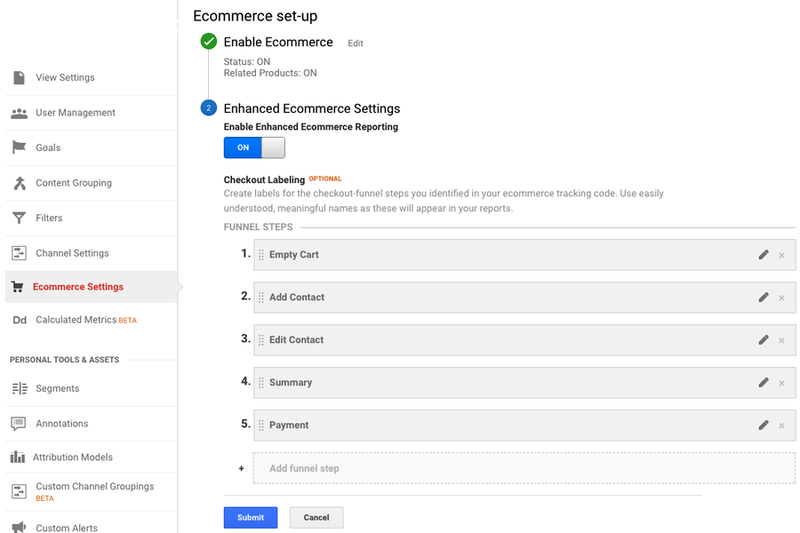 You can track each step in the checkout process through a Google Analytics acquisition funnel. See where and why people are dropping off. Create a new Google Analytics account (or use an existing one). Under Admin > Property > Tracking code look for the tracking id and make a note of it. Log into Google TagManager and find ish onCourse Google Analytics settings under variables. Put your tracking id in there to replace the dummy one. Back in Google Analytics, you should soon be able to the Tracking Code status update to show data coming in. Visit your website to generate a bit of traffic. When you have some time, explore the Analytics "goals" setup for ways to get useful information such as dropoff in your checkout rates. 'option': "Init Checkout Process" | "Add Payer" | "Edit Contact Details" | "Summary Page" | "Payment Page"
'option': "Change Parent" | "Add concession" | "Add contact" | "Add a company" | "Add a payer" | "Payment Page (Corporate Pass)" | "Payment Page (Credit Card)"
Google webmaster tools is a useful resource for to you review aspects of your website. Here you are able to see your site in the way Google sees it, understand how markup affects Google's schema parsing, and see which pages are indexed. Its also an important place to tell Google that you've changed domain names, ensuring your SEO isn't left behind on your old site. In order to log in, Google will give you an html file to upload to your site. Just log into webDAV and put that file just inside the 's' folder. Publish your site for Google to be able to see this file. We generate a /sitemap.xml file automatically which you can add to Google's webmaster tools. This allows Google to quickly find all the pages on your site without crawling through them one at a time, and it also gives Google hints about when those pages are updates so that they are crawled more quickly. The html markup of your site is customisable throughout, but by default you get some robust templates that Google will love. By building the html of your onCourse site with a clear structure and meaning, search engines such as Google are able to make sense of the structure and meaning. onCourse comes with good html that gives you a good starting point. For example, each page should only have a single h1 element, sections, footer and other modern html elements. Although this is not strictly an SEO benefit, adhering to accessibility standards means that students with disabilities such as poor sight will be able to access your website more easily. This goes hand in hand with good semantic HTML and also means that Google and other search engines will properly index your site and understand the content structure rather than just index a mass of words. Schema.org is a set of markup rules endorsed by Google and other search engines. It specifies ways to annotate the html to give it specific meaning allowing Google to create rich search results. For example, we can markup data so that Google can provide navigation structure, course dates, prices and other information right in their search results. The navigation and structure of the site's page are important to good search results. Some pages in your onCourse site don't last very long. In particular, the class pages with a URL like /class/ABC-123 will be irrelevant as soon as that class is finished. You don't want to accumulate page rank on these pages, only for that to evaporate. onCourse automatically adds a canonical link to the correct course page, transferring any page rank and inbound links to somewhere it will do good. onCourse has clean URLs which are easy for users and contribute to your SEO. All course detail and list pages contain the word "course" and you are free to create long course codes which contain useful SEO keywords. And your tag structure can be structured however you want.. For example, a URL like "/courses/business/communication" picks up several important keywords. If you ever change URLs it is vital that you don't lose page rank on those old pages. While you don't need to worry about classes, tags and course pages can accumulate valuable scores and you should implement redirects to the closest new page. og:image for course and class detail pages. The image is pulled from the first attachment of the appropriate type (jpg/png) linked to the course. og:type is hardcoded to "website" to satisfy Facebook. og:description and meta-description. The contents of this field is automatically populated from the beginning of the text in the course description or page content. Special formatting is stripped out (eg. headers and images). For this reason, it is useful for you to ensure the first paragraph of text is relevant and well written. Page title (and og:title) is constructed using the name of your college and other details such as the name of the course or tag, or the name of the page. These tags are useful for both Facebook, Bing and Google, helping you display better search results from data discovered by each of their crawl engines. Google has indicated that sites with end-to-end encryption will get higher search rankings since they are more likely to be ligitimate sites which care about the privacy of their users. All onCourse sites redirect immediately to HTTPS for even the non-payment gateway parts of the site. A lot of effort goes into making onCourse really fast, even when displaying faceted search results from thousands of courses. We use separate SSL/TLS load balancers to remove encryption load from the application servers, we cache database requests and page rendering, and use Apache Solr as a high speed search cache. We also offload large image serving to a third party AWS S3 storage, again increasing the speed with which your site displays. The end result of all this is that search engines give your site bonus points for being fast. Which is good.